Castle Point is a small site 300 yards from the sea. The attractive beaches at Castle Point, Rockcliffe, and Glenstocken Cove are short walks from the site. Castle Point itself is the site of an ancient Roman fort on a headland at the estuary of the river Urr. The headland provides panoramic views across to the Lake District, the Isle of Man, Heston Island, Rough Island and up the estuary to Kippford. There are lovely walks from the site - over the cliffs from Castle Point past Glenstocken cove, the Monument (lots of cormorants at nesting time ) and Sandyhills. 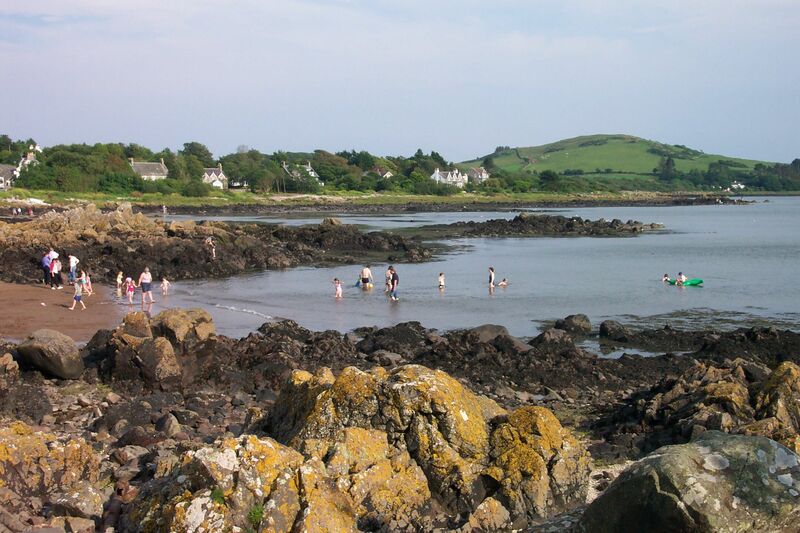 Other walks are along the Merse to Rockcliffe, along the Jubilee Path to the sailing village of Kippford (coffee or beer at the pub at the harbour), and up the Muckle Knowe and Mote of Mark (a 5th Century fort). When the tide is out it is possible to walk from the site across to the bird sanctuary of Rough Island. Information on walks around the site and in Galloway can be found at Walks in Galloway . This site also provides maps. The site is very close to the 7 Stanes cycling trails. For the nearby purpose built mountain bike trail and cycle tracks in the forestry see 7 Stanes and YouTube video and Nearest Cycle Trail . We offer a locking cycle shed for bikes and a drying room if it is wet. Watersports, archery, laser quest and other activities can be found at the Galloway Activity Centre and at The Laggan Outdoor Centre. Children will also enjoy the animals and activities at Mabie Farm Park. Pony trekking is also available nearby. It is a short drive or walk to the popular sailing centre of Kippford with its pubs and restaurants. Details about the Galloway red kite trail can be found at Red Kite Trail. Also there is the Cream O'Galloway ice cream factory, which has pre-school activities; a Cocoa Bean Factory (with indoor and outdoor activities); and a bird sanctuary RSPB Mersehead (with activities for adults and children) nearby. Several 9 and 18 hole golf courses, with non member access, are nearby. The closest 18 hole is at Colvend Golf Club. For hill walkers Screel, Bengairn, Cairnsmore of Fleet, and Criffel are close; in the Galloway National Park (three hundred square miles) Merrick and Mulwharcher are within easy travelling distance, see hill walking in Galloway . This area is also famous for its dark sky an attraction for star gazers. The sky around the site is also dark. For fishing see e.g. Fishing in Galloway, Trout Fishing in Galloway, Kirkcudbright Angling . Other descriptions about the area see, for example, Goboony on Galloway Goboony is the online sharing platform for motorhome and campervan owners to rent out their vehicles to passionate campers. Our off-site storage facility is available for summer storage of caravans to new and existing guests of Castle Point. It is intended for customers who intend to spend the majority of their caravan holidays on our site. The fee is £2.50 per night. Minimum period 1 week. Full information is available on request.